Existing home sales increased 1.3% in April, but fell 6.8% from the same period a year ago. The National Association of Realtors (NAR) reported April 2014 total existing home sales at a seasonally adjusted rate of 4.65 million units combined for single-family homes, townhomes, condominiums and co-ops, up from 4.59 million units in March. The West and South increased by 4.9% and 1.0% respectively in April, the Northeast remained unchanged, and the Midwest decreased 1.0% from the previous month. Year-over-year, all regions decreased, ranging from a 3.5% drop in the South to a 10.0% decrease in the West. Seasonally adjusted condominium and co-op sales increased 7.3% in April, and were unchanged from the same period a year ago. First-time buyers comprised 29% of April 2014 sales, down from 30% in March and were unchanged from last April. The January first-time buyer share of 26% was the lowest since NAR began reporting that share monthly in October 2008. The historical average first-time buyer share is about 40%. Tight lending conditions continue to buffet first-time buyers despite reports of easing standards. Total housing inventory leaped 16.8% in April to 2.29 million existing homes. At the current sales rate, the April 2014 inventory represents a 5.9-month supply, up from a 5.1-month supply in March and up from a 5.2-month supply a year ago. Continuing a positive note, NAR also reported that the April median time on market for all homes was 48 days, down from 55 days in March but up from 43 days during the same month a year ago. NAR reported that 41% of homes sold in April were on the market less than a month, compared to 37% of all homes sold in March. The share of distressed sales ticked up to 15% in April from 14% in March, but was down from 18% in April 2013. Distressed sales are defined as foreclosures and short sales sold at deep discounts. All cash sales comprised 32% of April transactions, down from 33% in March, and unchanged from the same period a year ago. Individual investors purchased an 18% share in April, up from 17% in March but down from 19% during the same period a year ago. Some 70% of April investors paid cash, virtually unchanged from 71% last month. The April median sales price for existing homes of all types increased to $201,700 from the downwardly revised March median sales price of $196,700 and was up 5.2% from a year ago. The median condominium/co-op price increased again to $205,500 in April, up from a downwardly revised $198,300 in March and was up 8.3% from April 2013. The Pending Home Sales Index increased 3.4% in March, the first increase since June 2013. Therefore, it was expected that April existing home sales would respond with a modest increase. Despite the slight increase in the April investor share, higher existing home prices make these homes less appealing for investors, and a future withdrawal of that demand will take some steam out of existing sales. The increased inventory of existing homes coupled with increased new home construction will expand choices for first-time buyers, the missing link in this housing recovery. While existing home sales struggled through a sub-par first quarter, new home sales continue to post year-over-year gains (also tempered by recent weather impacts) as investor activity cools. The April new home sales numbers will be released tomorrow. Existing home sales decreased 0.2% in March, and fell 7.5% from the same period a year ago. The National Association of Realtors (NAR) reported March 2014 total existing home sales at a seasonally adjusted rate of 4.59 million units combined for single-family homes, townhomes, condominiums and co-ops, down from 4.60 million units in February. The Northeast and Midwest increased by 9.1% and 4.0% respectively from February, while the South and West decreased 3.0% and 3.7% respectively. Year-over-year, all regions decreased, ranging from a 3.0% drop in the South to a 13.4% decrease in the West. Seasonally adjusted condominium and co-op sales fell 1.8% in March, and were down 8.3% from the same period a year ago. First-time buyers comprised 30% of March 2014 sales, up from 28% in February and were unchanged from last March. The January first-time buyer share of 26% was the lowest since NAR began reporting that share monthly in October 2008. The historical average first-time buyer share is about 40%. Tight lending conditions continue to buffet first-time buyers and NAR points to high levels of student debt and tight inventory in the lower price ranges as important factors. Total housing inventory increased 4.7% in March to 1.99 million existing homes. At the current sales rate, the March 2014 inventory represents a 5.2-month supply, up from a 5.0-month supply in February and up from a 4.7-month supply a year ago. On a positive note, NAR also reported that the March median time on market for all homes was 55 days, down from 62 days in February and 62 days during the same month a year ago. NAR reported that 37% of homes sold in March were on the market less than a month, compared to 34% of all homes sold in February. As the market cures, the share of distressed sales decreased to 14% of March sales, down from 16% in February and 21% a year ago. Distressed sales are defined as foreclosures and short sales sold at deep discounts. All cash sales comprised 33% of March transactions, down from 35% in February, but up from 30% the same period a year ago. Individual investors purchased a 17% share in March, down from 21% in February and 19% a year ago. Some 71% of March investors paid cash, up from 73% last month. The median sales price for existing homes of all types increased to $198,500 in March from a downwardly revised $188,300 in February, and was up 7.9% from a year ago. The median condominium/co-op price soared to $200,800 in March, up from a revised $185,100 in February and was up 11.6% from March 2013. The Pending Home Sales Index fell 0.8% in February to the lowest level since October 2011. Therefore, it was expected that March existing home sales would remain flat. The decline in the March investor share suggests that the continued run up of existing home prices will eventually make these homes less appealing for investors, and a future withdrawal of that demand will further depress existing sales. NAR continues to make the point that increased new home construction will free up existing inventory for first-time buyers. While existing home sales are down year-over-year, new home sales continue to post year-over-year gains (tempered by recent weather impacts) as investor activity cools. The new home sales numbers will be released tomorrow. 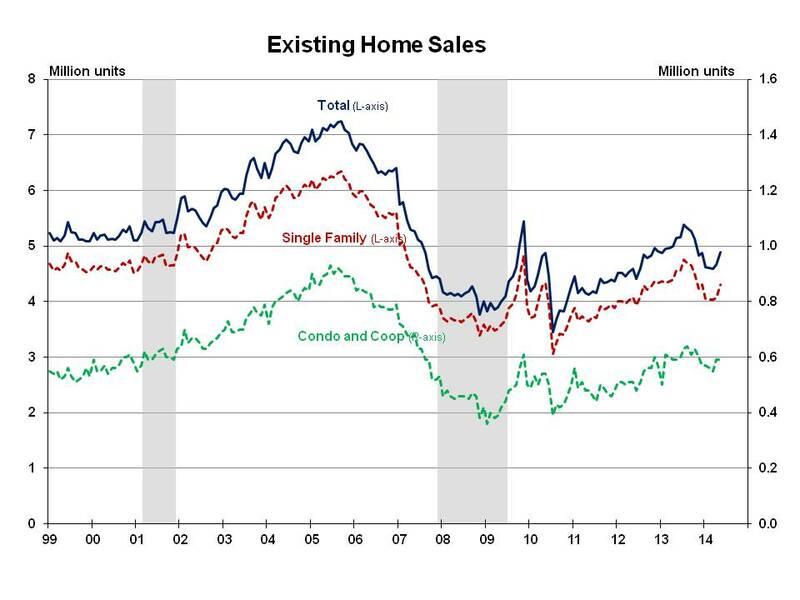 Existing home sales increased 1.0% in December, but were down 0.6% from December 2012. The National Association of Realtors (NAR) reported December 2013 total existing home sales at a seasonally adjusted rate of 4.87 million units combined for single-family homes, townhomes, condominiums and co-ops, up from a downwardly adjusted 4.82 million units in November. Existing home sales in the West and South increased 4.8% and 3.0% respectively in December, while in the Northeast and Midwest existing home sales decreased 1.5% and 4.3% respectively. Compared to last December, the South and Northeast increased 4.6% and 3.2% respectively. Existing home sales decreased in the Midwest and West by 0.9% and 10.7% respectively from the same month a year ago. The December 2013 level of single-family existing sales increased 1.9% to a seasonally adjusted 4.30 million sales, but were down 0.7% from the same month a year ago. Seasonally adjusted condominium and co-op sales decreased 5.0% in December to a seasonally adjusted 570,000 units, and were unchanged from the same period a year ago. The total housing inventory decreased 9.3% in December to 1.86 million existing homes. At the current sales rate, the December 2013 inventory represents a 4.6-month supply compared to a 5.1-month supply in November, and a 4.5 -month supply of homes a year ago. NAR also reported that the December median time on market for all homes was 72 days, up from 56 days in November but down from 73 days during the same month a year ago. NAR reported that 28% of all homes sold in December were on the market less than a month, compared to 35% in November. The share of distressed sales in December held steady for the fourth straight month at 14%, compared to 24% for the same period a year ago. Distressed sales are defined as foreclosures and short sales sold at deep discounts. After decreasing for four months, the median sales price for existing homes of all types was $198,000 in December, up from a revised $195,500 in November and up 9.9% from December 2012. Compared to a year ago, median sales prices increased in all four regions, ranging from 16.0% in the West to 3.6% in the Northeast. The median condominium/co-op price was $198,600 in December, up 10.9% from December 2012. In December 2013, all cash sales were 32% of transactions, the same as in November, but were up from 29% in December 2012. Investors accounted for 21% of December 2013 home sales, up from 19% in November and the same level as a year ago. The all cash sale share and investor share appear to represent a steady portion of the existing home sales market. First-time buyers accounted for 27% of December 2013 sales, down from 28% in November and 30% in December 2012, and remain well below the historical average of about 40%. The November Pending Home Sales Index ticked up 0.2% in November, so it was anticipated that existing home sales would increase moderately. As mortgage rates remain steady, a long-term trend of increasing existing home sales will continue. November existing home sales decreased from October to a level below the same period a year ago. 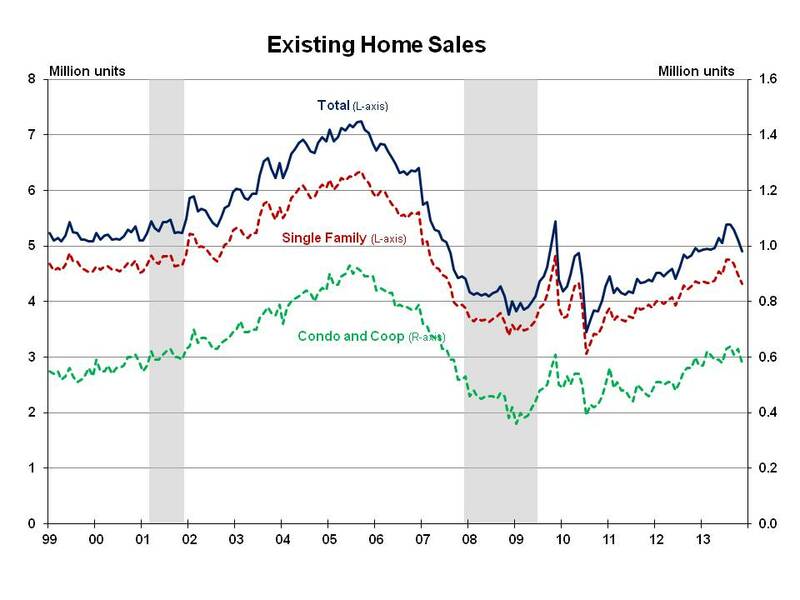 Existing home sales decreased 4.3% in November, and were down 1.2% from November 2012. The National Association of Realtors (NAR) reported November 2013 total existing home sales at a seasonally adjusted rate of 4.9 million units combined for single-family homes, townhomes, condominiums and co-ops, down from 5.12 million units in October. All regions declined in November, ranging from an 8.5% decrease in the West to a 2.4% decrease in the South. Compared to the same period a year ago, existing sales in the Northeast and South increased 6.6% and 1.0% respectively. The Midwest was unchanged, while existing home sales the West decreased 10.1% from November 2012. The November 2013 level of single-family existing sales fell 3.8% to a seasonally adjusted 4.32 million sales, and were down 0.9% from the same month a year ago. Seasonally adjusted condominium and co-op sales decreased 7.9% in November to a seasonally adjusted 580,000 units, and were down 3.3% from the same period a year ago. The total housing inventory decreased 0.9% in November to 2.09 million existing homes. At the current sales rate, the November 2013 inventory represents a 5.1-month supply compared to a 4.9-month supply in October, and a 4.8-month supply of homes a year ago. NAR also reported that the November median time on market for all homes was 56 days, up from 54 days in October but down from 70 days during the same month a year ago. NAR reported that 35% of all homes sold in November were on the market less than a month, compared to 36% in October. The share of distressed sales in November held steady for the third straight month at 14%, compared to 22% for the same period a year ago. Distressed sales are defined as foreclosures and short sales sold at deep discounts. The median sales price for existing homes of all types was $196,300 in November, down for the fifth straight month, but up 9.4% from the same month a year ago. Compared to a year ago, median sales prices increased in all four regions, ranging from 16.5% in the West to 5.7% in the Northeast. The median condominium/co-op price increased slightly to $197,400 in November from a downwardly revised $196,500 in October, and was up 10.0% from the same period a year ago. In November 2013, all cash sales were 32% of transactions compared to 31% in October, and 30% in November 2012. For the third consecutive month, investors accounted for 19% of November 2013 home sales, the same level as a year ago. For the third consecutive month, first-time buyers accounted for 28% of November 2013 sales, unchanged from October, but down from 30% during the same month a year ago and well below the historical average of about 40%. Based on the 0.6% drop in the October Pending Home Sales Index, it was expected that existing home sales would decline. In October, NAR chief economist Lawrence Yun asserted: “More new home construction is needed to help relieve the inventory pressure and moderate price gains.” That call was met by a string of excellent reports from the new residential construction sector including a 25.4% increase in October new home sales, a 4 point December increase in the NAHB/Wells Fargo Housing Market Index to 58 and a 22.7% increase in November total housing starts. A higher share of new home buyers are trade-up buyers and higher income households, and were financially better prepared to overcome the increase in mortgage rates earlier this year. After a continuing period of adjustment over the next few months, the long-term trend of increasing existing home sales will continue.